The Youth Café is a fully inclusive, safe haven for young people, run from a renovated building in the centre of Elgin. More than just a place to hang out, it offers imaginative activities and courses on food and health during term-time and holidays, with most ideas coming from the young people themselves. The Youth Café is a project run by Elgin Youth Development Group (EYDG), a social enterprise and charitable company limited by guarantee. EYDG was set up by St Giles Church in 1998 after their newly recruited youth worker realised that there was a lack of places for young people to go in Elgin. The group’s directors raised £500,000 to set up the Youth Café in a derelict council-owned building in the centre of Elgin. The building has two halves with separate entrances. One half houses the Youth Café; the other is the ‘Inkwell’, a venue for hire with catering provided through the café. EYDG also runs other projects from the building – a volunteering project for young people (‘Delta Force’), outdoor education activities, after-school clubs and a variety of training courses. Young people have always been at the heart of decisions made about the Youth Café, right back to selecting the original architect and interior designs. It has a peer-elected young people’s management committee, Divas and Heroes, supported by the EYDG Youth Team. Divas and Heroes’ chair and secretary attend EYDG’s directors’ meetings where their plans for the café are discussed and ratified. EYDG is now independent of the church and governed by members of the local community. It has a core staff of three (project co-ordinator, administrator and social enterprise manager) plus a Youth Team, café staff and volunteers. Originally EYDG leased the building from Moray Council at a peppercorn rent, in return for having complete responsibility for the upkeep of the building. However, in 2013 the group successfully applied to the council for a community asset transfer. As owner, EYDG now has more options on funding sources and the group plans to develop the building into a community hub and training facility. The building is open all year round except for two weeks at Christmas and New Year. The Youth Café hosts after-school clubs in cooking skills, fitness and homework. For cooking, they run Confidence to Cook accredited courses using themes like ‘Licence to Cook’ and ‘Fun with Food’ to keep things interesting. Each course runs in eight week blocks, usually during term times, and can take up to 14 young people using the cooking equipment in the café. The courses are run by the members of the Youth Team who have completed the Confidence to Cook Training for Trainers course through NHS Grampian. Some places are filled through referrals from organisations like Quarriers Young Carers Support and Moray Food Network. EYDG facilitates this by emailing its programme to local organisations and joining in local roundtable discussions. The Youth Café is open three nights a week for 11-18 year olds. Entry is free. Young people can just hang out, play pool, use PlayStations or join in arranged activities that include cooking. Four young people over 16 are employed part-time for four months at a time as bar manager and chef. This gives them work experience and the opportunity to learn a wide range of skills. They are trained in Elementary Food and Health, First Aid and Child Protection. 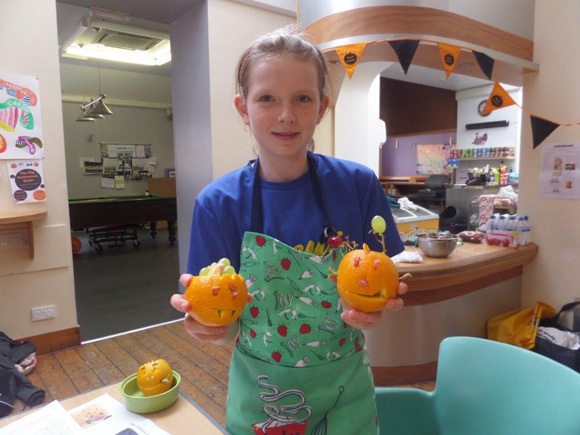 EYDG runs food and health activities during school holidays, based at the Youth Café. One example is ‘Brunchercise’ where participants make a healthy brunch together followed by games and other physical activities. There are also ‘Cookathons’ lasting a whole week, leading up to a big meal for friends and family. TV formats, like Master Chef, Ready Steady Cook and the Great British Bake Off, are adapted as part of the Cookathons. During school hours the building is used by older young people and other adults. 16-24 year-olds can take part in life skills training, including cooking skills. Some sessions are for groups in particular situations like leaving home to go to college. EYDG also runs Confidence to Cook courses for a variety of community groups, and some groups run their own courses from the building. EYDG and the Youth Café are mainly grant funded – funding bodies are listed on their website. However, grant funding has become increasingly difficult to find, so they are working on becoming more self-sufficient through social enterprise activities. In 2014 twenty per cent of its income came from the Inkwell and associated catering, along with local fundraising and donations. The Youth Café has around 6,000 visits from 450 young people in a year. On a Friday night up to 150 turn up; the majority are S1-S3, with around 20-25% from S4-S6. The cooking courses are extremely popular. 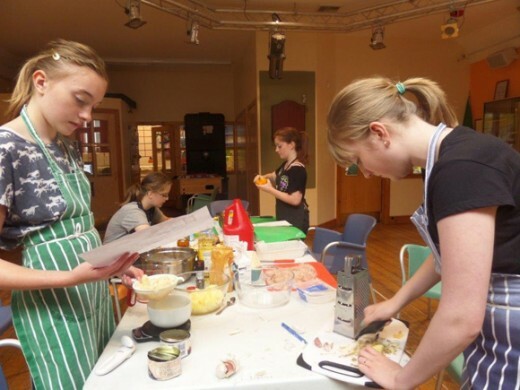 Around 200 young people take the Confidence to Cook course each year, and EYDG says it could easily fill many more courses if it had the time and resources. Reasons given for this are that: Elgin has many families trying to live on a very low income; schools no longer provide cooking skills training to this level; and the courses are such good fun! EYDG is looking for funding to refurbish the Inkwell, and make the building Elgin’s community hub. The plans include a purpose-built community kitchen where it can deliver or host more Confidence to Cook courses to a wide range of community groups. One motivation for developing the building as a community hub for all ages is a desire to do more intergenerational work involving older volunteers. More than anything the group wants to be able to keep doing what it does well.